For decades now, news reporters with zero nutrition education, government agencies using outdated information from the 1960's, and well-meaning but misinformed dieticians have pounded into your head that dairy fat from butter, cream, cheese, and other full-fat dairy products is terrible for you and "CLOGS" your arteries... but what if they've been WRONG all along? After all, it wouldn't be the first time that the government, the media, and dieticians have been wrong about a nutrition topic... remember for years when everyone falsely believed that trans fat laden margarine was better for you than butter? Wow, were they ever wrong about that! And remember the years when everyone falsely believed that egg yolks were bad for you ? Well, I think most of us are more educated now about that as well... At least I hope so! 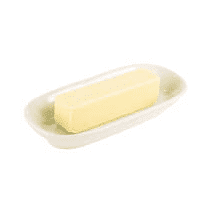 Did you know that between the years 1910 to 2000, the average annual butter consumption per person in the US decreased from 18 lbs per year in 1910 to less than 4 lbs per year in 2000... Meanwhile heart disease rates between 1910 to 2000 QUADRUPLED. Hmm... so let's think about that for a minute...we ate almost 5x the amount of butter on average in 1910 and yet heart disease was RARE at the time. Clearly the argument that so many health "experts" make about dairy fat being "deadly" is not accurate and needs to be re-evaluated. With regards to dairy fat from butter, cheese, and cream, if you believed the media that dairy fat clogs your arteries, then why do the French stay leaner and have a much lower rate of heart disease despite a diet very high in full-fat cheese, butter, and cream compared to Americans that purposely try to reduce their butter intake and choose non-fat or reduced-fat dairy products most of the time? Or why do the Swiss , known for their rich full-fat dairy products including lots of cheese display lower heart disease rates than Americans? Or how about the natives of the Caucasus Mountains in Eastern Europe that routinely live to over 100 years old while drinking full-fat dairy almost daily throughout their lives in the form of Kefir? We've also got the Maasai and Samburu tribes from Africa that eat a diet rich in full-fat dairy (4-5x the consumption of dairy fat on average than most Americans) and yet display robust health with a distinct lack of degenerative diseases like heart disease. We could go on and on with examples that show the opposite of what you've been told over the years about dairy fat, but the fact of the matter is that all of these "experts" that have told you to avoid dairy fat have been flat out WRONG for decades now! The TRUTH is... studies are consistently showing that certain unique compounds in dairy fat actually PREVENT the clogging of arteries and reduce your risk of heart disease! I'll tell you in a second about the powerful compounds in some types of dairy fat that can help reduce your risk of heart disease, but first, please realize that if you eat a lot of inflammatory foods such as sugar, corn syrup, refined grains (wheat and corn cereals, breads, etc), artificial trans fats, refined vegetable oils (soybean oil, corn oil), etc , you will most likely still be clogging your arteries from the inflammation caused by what these foods do to your insides. Note that the 3 nutrients that I'm discussing here that help protect you from heart disease are found mostly in GRASS-FED dairy (pasture-raised) and not conventional grain-fed factory farm dairy that's the majority of dairy found in the US. Also, realize that we're talking about benefits from the fat portion of the dairy specifically here (yes, the cream and butterfat), so this means FULL-FAT grass-fed dairy is where the benefits will come from and NOT all of these silly skim, 0%, or 1% reduced-fat varieties of yogurts, cheeses, etc. Note that most dairy from Europe and other parts of the world is typically grass-fed for the majority of their feed and only supplemented with smaller amounts of grain. For that reason, if you choose European cheeses, you're generally going to get a healthier type of cheese. And if you can't find butter or cream that's labeled as grass-fed or pasture raised, realize that true Irish butter (Kerrygold is a good brand of Irish butter in the US) or any European butter is usually grass-fed and a better choice. Although, as consumer awareness is increasing about the benefits of grass-fed dairy in the US, I've noticed that more and more US brands are offering grass-fed yogurt, cheeses, butter, cream, and kefir from small family farm operations that truly allow the cows to freely roam and forage on grass and herbs. Vitamin K1 is found in leafy greens and is definitely good for you. However, studies of vitamin K1 in relation to heart disease are neutral, meaning there's no negative or positive response in comparing vitamin K1 and heart disease. However, the story is quite different with vitamin K2 ! In one Dutch study reported in the Journal of Nutrition in 2004, people with the highest vitamin K2 consumption had a whopping 51% lower risk of heart attack mortality and a 26% lower risk of death from all causes compared to those eating the least vitamin K2! The study concluded that higher vitamin K2 consumption reduced arterial calcification . Vitamin K2 also helps prevent Arthritis ! That's right... recent studies are showing that Vitamin K2 not only protects against arterial calcification, but also inappropriate calcification in various soft tissues throughout the body, including your joints. You guessed it: grass-fed dairy fat (butter, cream, certain cheeses), organ meats, egg yolks, and certain fermented foods that use a specific starter culture. In terms of cheeses, brie and gouda are apparently the highest in vitamin K2 due to the cultures that are used to ferment the cheese. And goose liver is extremely high in vitamin K2 as well. Isn't it ironic that so many health "experts" have been telling you for decades to avoid dairy fat, and yet dairy fat contains one of the most powerful compounds being studied that helps prevent arterial calcification and clogged arteries. As I always say, beware of who you trust when it comes to nutrition information! Apparently, new research is proving what Weston Price knew all along many many years ago... in order for your body to properly utilize oral vitamin D, you need vitamin K2 as well. In many of Dr. Price's experiments, he found that patients only had minor improvements in health parameters when given cod liver oil (a concentrated natural source of vitamin D), but when cod liver oil was combined with grass-fed butter for vitamin K2, the health improvements were significantly better, as the vitamin K2 and vitamin D worked together synergistically inside the body. Also keep in mind that vitamin K2 is generally NOT found in multi-vitamins or other supplements, so you need to obtain it from grass-fed dairy fat or other animal foods such as egg yolks or organ meats. For those choosing to go on a vegan diet, please realize that vitamin K2 deficiency is a very serious concern. Vitamin K2 deficiency can disrupt the balance and function that vitamin D and calcium play inside your body (causing inappropriate calcification in your body if you're deficient in K2) and can lead to arterial calcification in vegans that ignore this important nutrient. Vitamin B12 is another important nutrient that vegans are typically extremely deficient in, and supplemental forms are not as well utilized by the body. CLA is a unique type of healthy fat that's found in the fat from grass-fed meat or dairy in ruminant animals such as sheep, goats, cows, deer, etc. In separate studies, CLA has been found to lower the risk for cancer and arteriosclerosis (hardening of the arteries), in addition to improving fat loss. Grass-fed dairy or meat has been found to contain 3-5x the amount of healthy CLA fats as grain-fed dairy or meat. In one study in 2010 , researchers studied the effects of consumption of a sheep's milk pecorino cheese on atherosclerotic biomarkers (indicating risk for heart disease), and found that the dairy fat in this cheese improved the subjects markers! They concluded: "intake of the tested dairy product naturally rich in cis-9, trans-11 CLA appeared to cause favourable biochemical changes of atherosclerotic markers. " A search of conjugated linoleic acid in relation to cancer and fat loss on pubmed also brought up dozens of positive studies showing relationship between CLA and reduced cancer risks and improved weight loss. CLA is yet another example of an extremely healthy fat contained in dairy fat, and higher in grass-fed dairy compared to grain-fed. Yet another reason why I proclaim that most "experts" and dieticians out there telling you to choose skim or low-fat versions of yogurt, cheeses, or kefir are dead wrong. Enough with the fat-phobia! As we're seeing, full-fat dairy can be healthier and taste better too! I don't think we need to go into great detail on this one, as most people are aware that omega-3 fatty acids are very important for heart health and almost every aspect of health related to inflammation with more benefits to your body than I could even list here. And it's no secret that pasture-raised dairy fat is a great source of omega-3 fatty acids. Just keep in mind that pasture raised dairy fat contains a MUCH better ratio of omega-3 to omega-6 fats than does conventional grain-fed dairy fat. Most people already consume FAR too much omega-6 fats, and need to raise their levels of omega-3 fats. Grass-fed dairy fats can certainly help with that goal, just like fish oils do! With everything in this article being about the health benefits of these 3 super-nutrients found in grass-fed dairy fats, are grain-fed dairy fats actually bad for you? Well, the way I see it is that the fats in grain-fed dairy are "neutral", meaning I don't believe they are terrible for you like hydrogenated oils are bad for you, but I wouldn't call grain-fed dairy fats beneficial either. Just be aware that pesticides and other harmful chemicals can accumulate in the fat portion of dairy, so if you choose to use grain-fed dairy, choosing organic is very important. On the other hand, if it's grass-fed dairy you're eating, it's less important that it's also labeled as organic since the cows will naturally be exposed to less chemicals in a pasture-raised environment. Aged cheeses made from pasture-raised milk (European cheeses are generally grass-fed) -- Note that aged cheeses are generally more digestible than non-aged cheeses since microbes have already partially broken them down. Lassi - another form of fermented milk, Indian style, and similar to Kefir. Homogenized/pasteurized commercial milk - homogenized milk fat is thought to be harmful to health due to the microscopic fat particles that are formed from the homogenization processing. Skim milk or fat-free dairy of any type -- There's a reason that nature provides fat in this food source. When us foolish humans artificially remove all of the natural healthy fat from dairy, studies show that more health problems are associated with dairy in that specific case. You need full-fat dairy to get real health benefits, not skim milk or fat-free cheese or yogurt..
Full-fat grass-fed dairy is NOT the "dangerous" fat that you've been led to believe by the media, the government, and some dieticians. As you can see in this article, there are at least 3 super-nutrients in the fat portion of dairy that are shown to PROTECT you from heart disease, as well as other health benefits. Oh, and let's not forget that dairy fat tastes great! I'll take REAL cream in my coffee any day over fake coffee creamer laden with hydrogenated oil and corn syrup. I'll take full-fat creamy yogurt over non-fat yogurt any day. I'll enjoy a good full-fat aged cheese instead of some silly fat-free processed cheese any day too, knowing that the full-fat aged cheese actually does a body good. I personally choose to cook with butter frequently (mixed with coconut oil many times), and I enjoy full-fat grass-fed cream whenever I drink coffee (Organic Valley has a great pasture-raised cream that's my favorite). I also drink full-fat Greek style Kefir most days of the week, and I enjoy all of these foods not just for their great taste, but also knowing that they only HELP protect my health. And this daily ration of dairy fat is certainly not adding any body fat to my frame... I'm still as lean as ever. As you now know, the CLA in grass-fed dairy fat actually aids fat loss, and the healthy fats overall can help to reduce cravings, control appetite, and balance your hormones. So let's all please stop being afraid of dairy fat, as long as you avoid that cheap homogenized milk! By the way, make sure to read my previous article on The TRUTH about yogurt for everything you need to know about yogurt, both bad and good.